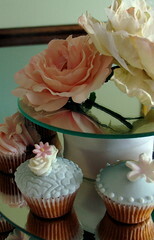 Boxed cupcakes for my local school fete (Clovelly Public School) for tomorrow. 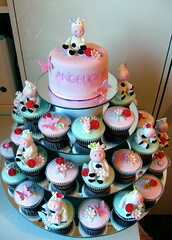 Payment for cakes must be finalised BEFORE delivery /pick up or cakes will not be released. Stands not returned on time incur a $50 per day late fee, stands not returned at all incur a fee of stand cost plus expenses for costs of new stand & non return of stand deposit if it has been paid. Please note: Our invoice is standard & has on it "refundable deposit of $150.00 on return of stand" which is obviously meant for those who actually HIRE a stand & pay a deposit for it. Obviously if for whatever reason we haven't charged a deposit for the stand, or you haven't actually hired a stand, than you CANNOT be refunded $150.00. it does NOT mean we will give you $150.00 for free. We CANNOT refund what you haven't given us. We apologise for this but we are no longer being lenient due to a few incidents & non payments. 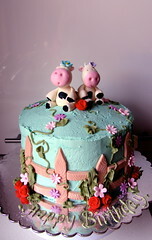 Edible sugar cows, flowers & butterflies for a christening. 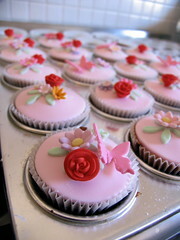 Edible flowers & butterflies.........on chocolate mud cupcakes.